You've found the home page of Kira and Joe Jewett, Irish and Celtic fiddlers. 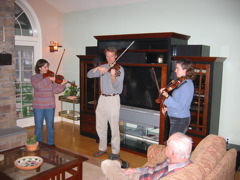 We love to play Irish music and have been doing it for years. We've studied with folks like Brian Conway, Martin Hayes, Brendan McGlinchey and lots more. We offer lots of services! Please contact us at kirafiddle (at) gmail.com for availability, pricing or questions. You can also comment on this post! "I can't thank you enough for making the trip to New York and sharing your love of Irish fiddle music with the people of Holy Trinity and others from the neighborhood. I heard so many enthusiastic responses, including, 'When can they come back?!!' . . . . I have learned from you that Irish music is. . . inclusive, embracing, and fun for all." I am a science teacher, primitive skills practitioner, Celtic fiddler, mom of 2, wife of 1 and am deeply committed to helping myself, my family, my students and the world live sustainably.